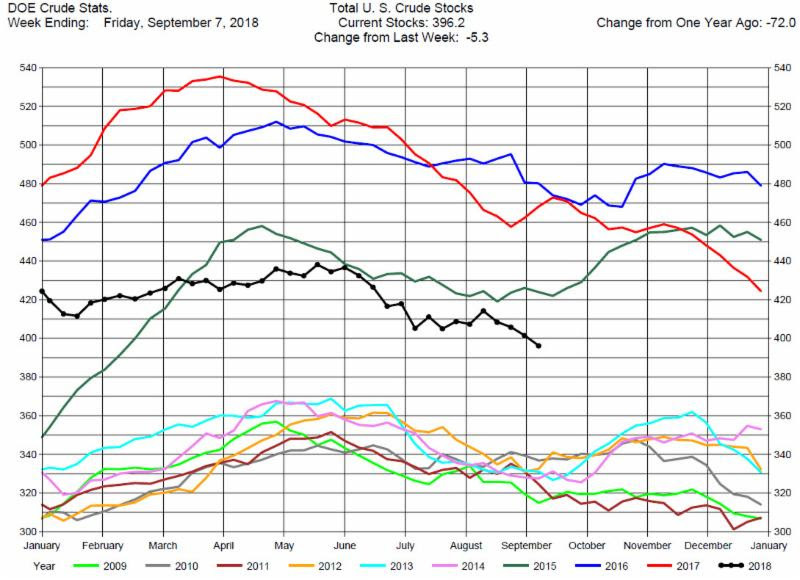 The DOE reported Total Crude Oil Inventories decreased by 5.3 million barrels to 396.2 million barrels for the week ending September 7, 2018, while expectations average was for a 2.4 million barrel decrease. The range of expectations was from a 4.6 million barrel draw to a 1.5 million barrel build. 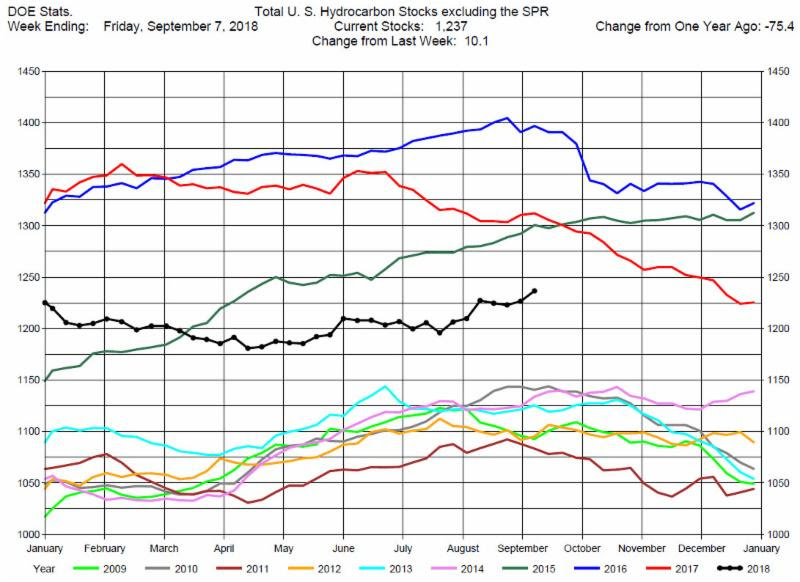 Overall hydrocarbon supplies increased by 10.1 million barrels to 1,237 million barrels. 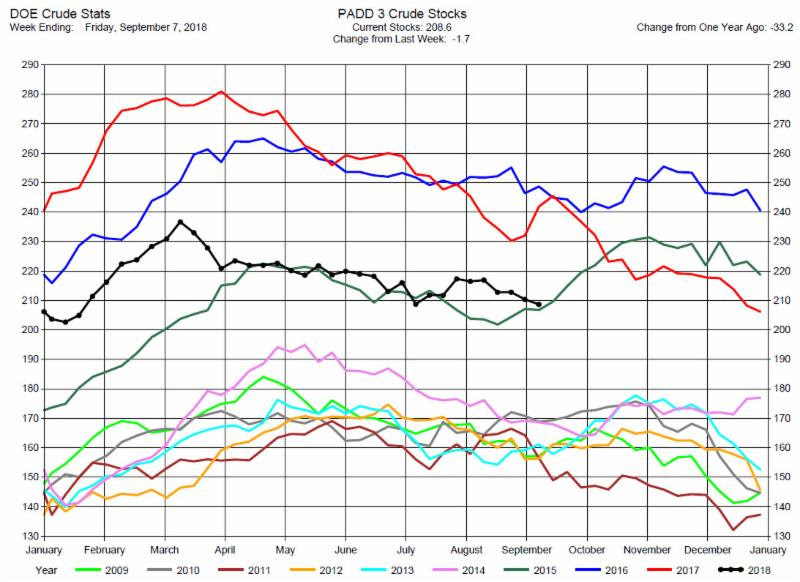 Crude Oil Production decreased by 100,000 barrels per day to 10.9 million barrels per day. 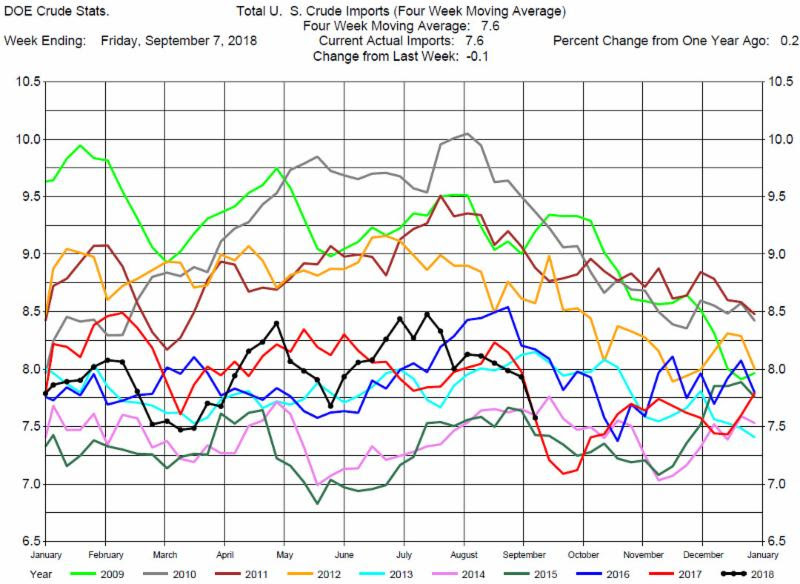 Total Crude Imports were down by 100,000 barrels per day to 7.6 million barrels per day. Total Refinery Crude Runs were up 200,000 barrels per day to 17.85 million barrels per day. 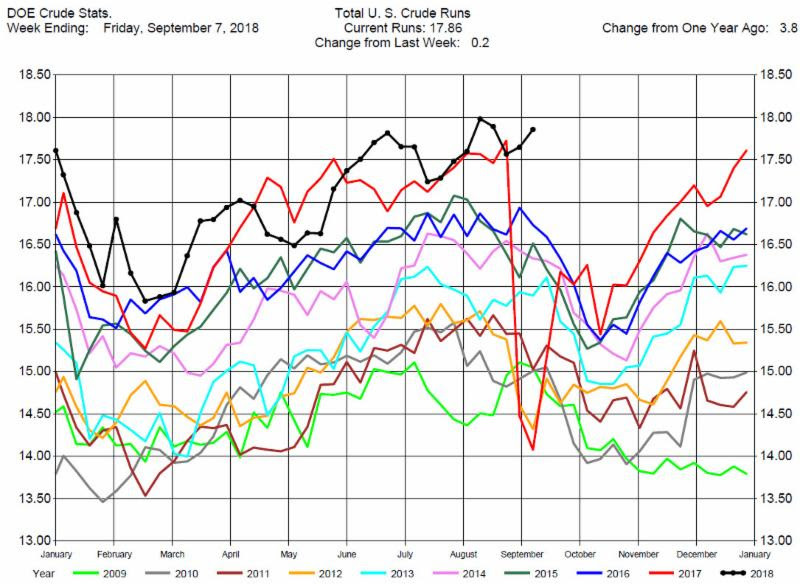 Despite the draw in crude oil inventories overall petroleum inventories increased by 10.1 million barrels so the DOE report was bearish to refined products crack spreads. Prices jumped with the release of the report, but then fell back for much of the trading day. However, prices settled up at least $1.00 for the day. Crude oil prices remain in the trading range of $65 to $71. However, the market sentiment is growing more bullish as Iranian crude exports are on a decline. As we have noted before, a definitive close above $72 would have indicated a sustained bull trend to the upside. We recommend waiting for the geo-political issues to become clearer before taking a position in the crude market. 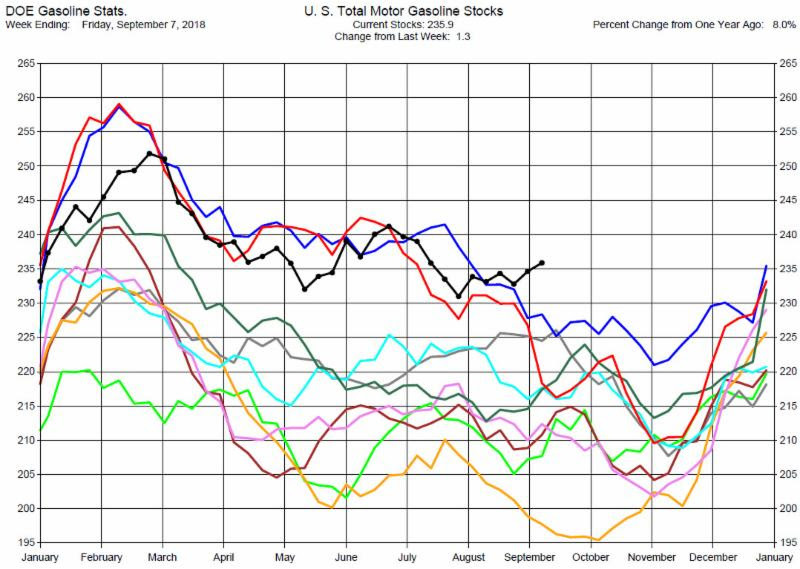 Gasoline Stocks Build, Greater than Expectations. 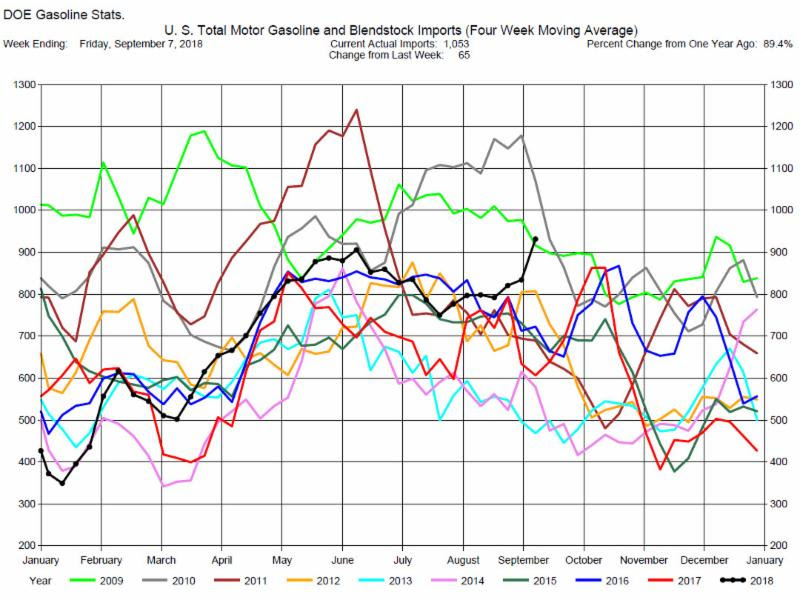 Total MotorGasoline Inventories increased by 1.3 million barrels to 235.9 million barrels for the week ending September 7, 2018, while expectations average was for a 500,000 barrel increase. The range of expectations was from a 2.0 million barrel draw to a 2.4 million barrel build. Implied Demand was up by 60,000 barrels per day to 11.3 million barrels per day. 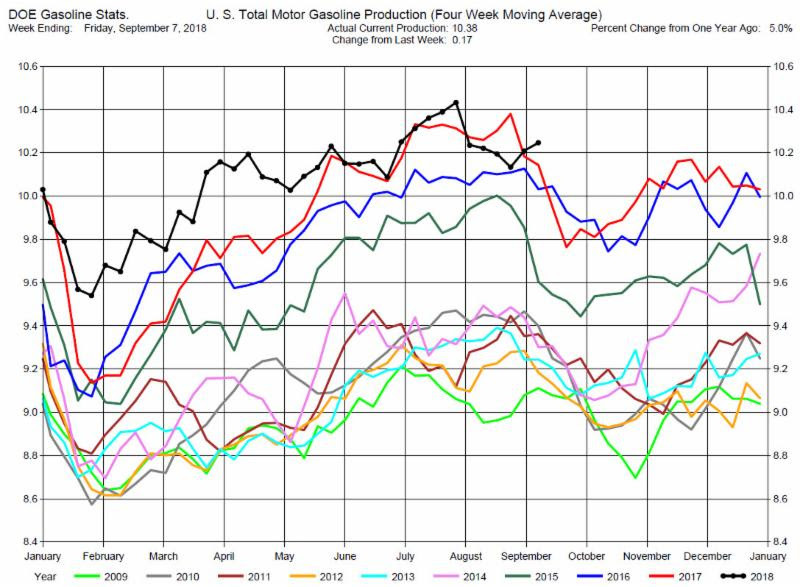 Gasoline Production was up by 170,000 barrels per day to 10.36 million barrels per day. 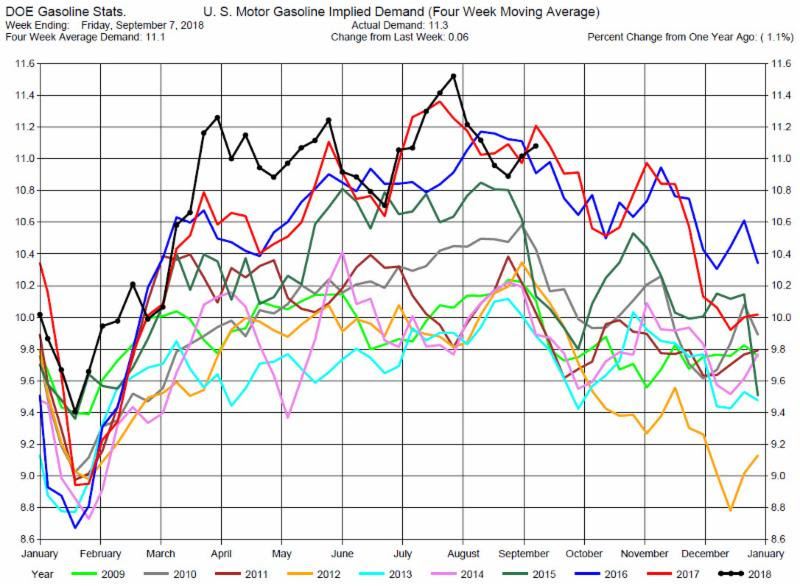 Despite the large increase in Gasoline Inventories, gasoline prices increased along with the rise in crude oil prices. 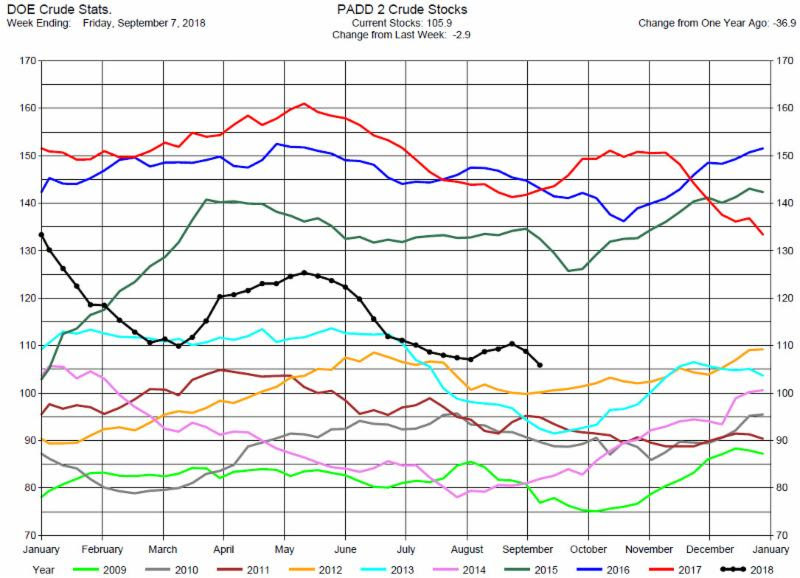 Gasoline crack spreads temporarily weakened but will probably rebound as gasoline prices in the southeast have spiked due to Hurricane Florence and the shortage of supply. We still suggest considering long positions in the out month cracks such as the November or December gasoline cracks. 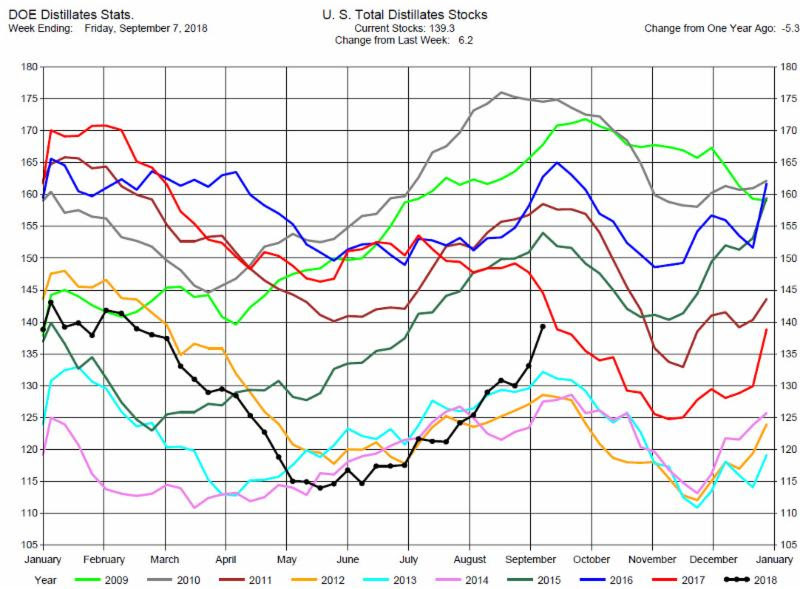 Distillates Stocks Build, Much Greater than Expectations. 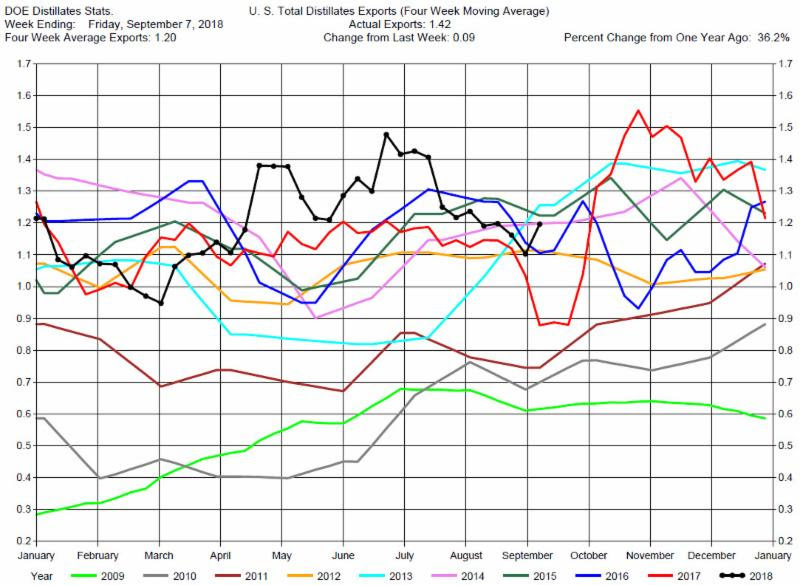 Total Distillates Stocks increased by a surprising 6.2 million barrels to 139.3 million barrels for the week ending September 7, 2018, while expectations average was for a 1..5 million barrel build. The range of expectations was from a 500,000 barrel build to a 3.1 million barrel build. 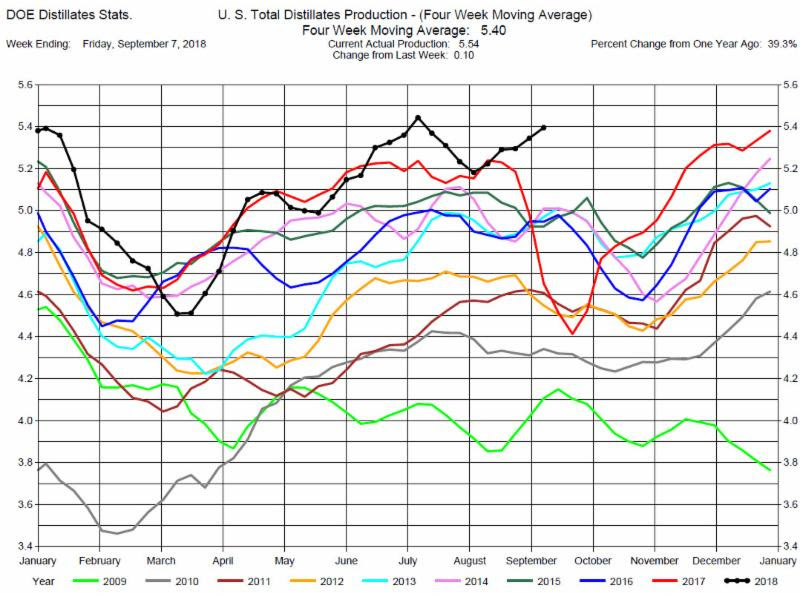 Total Distillates Production was up 100,000 barrels per day to 5.54 million barrels per day. 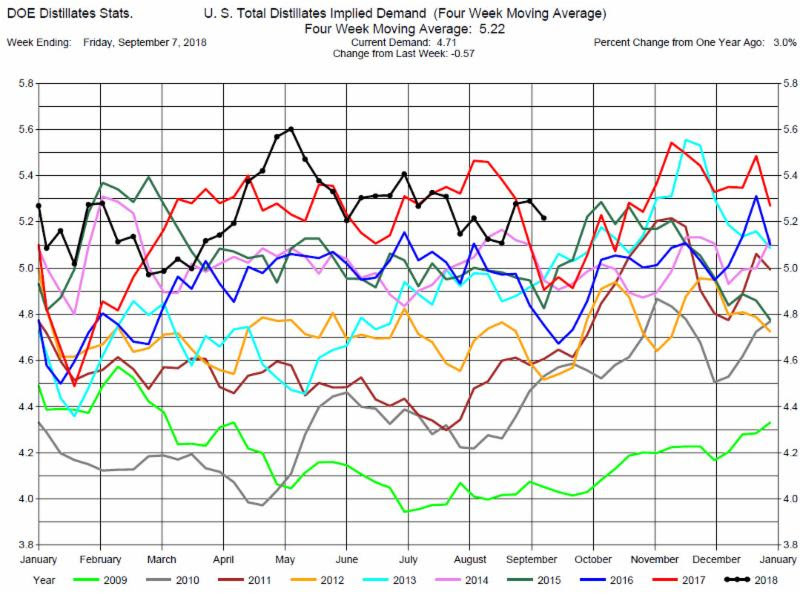 Total Distillates Implied Demand decreased by 570,000 barrels per day to 4.71 million barrels per day. 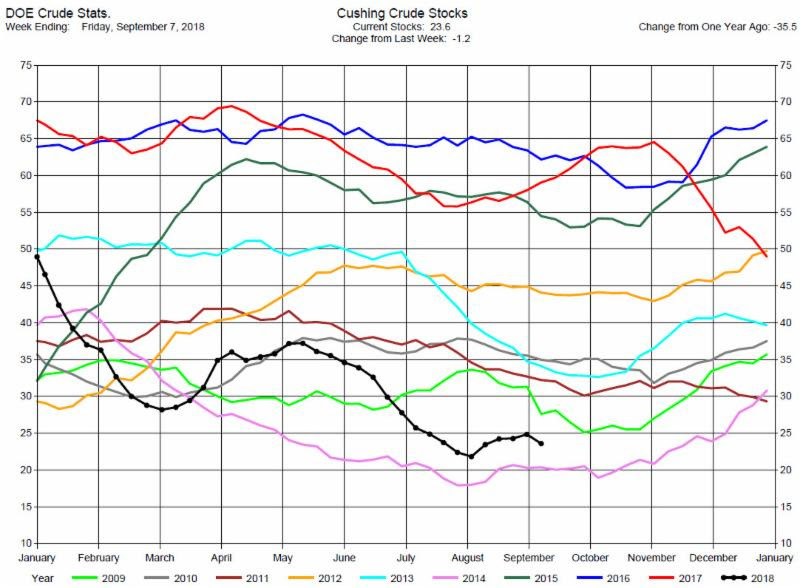 Heating Oil crack spreads have strengthened with the increased price of crude oil. We still suggest considering long positions in the out months Heating Oil cracks such as the November or December cracks.